Leongatha, a rural town, is 115 km south-east of Melbourne. It is on the South Gippsland Highway in the southern Strzelecki Ranges. The Leongatha district was among the last parts of South Gippsland to be settled. Settlement progressed along the coastline, along the highway through Drouin and Morwell and then south from Morwell towards Mirboo North. A railway from Morwell to Mirboo North was opened in 1886, one year before even a post office opened in the Leongatha area. When farm settlers came to Leongatha in 1882 they were met by dense bracken and saplings. Where this dense growth was absent there were tall trees with vast girths. The fertile red basalt soil and moist climate provided ideal growing conditions. A town was surveyed about 10 km north of Leongatha. Named Koorooman, it was the place where a post office (in a tree hollow) and a hall (1888) were found. At the same time the great southern railway was being surveyed. After crossing the difficult Koo Wee Rup swamps near Western Port Bay, it reached Loch and Korumburra in 1891. Work had gone on ahead along the surveyed route and the railway construction south of Koorooman was provided with a school in 1889. The railway settlement was the start of Leongatha, officially named in 1890. According to Bunce's Language of the Aborigines of the Colony of Victoria (1859), Leongatha is an Aboriginal word relating to teeth. 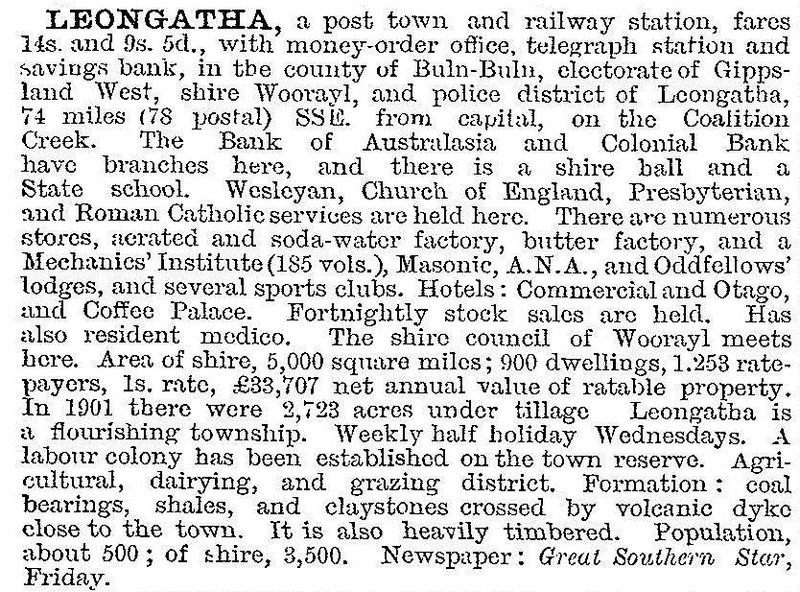 The railway reached Leongatha in 1891. The town already had a newspaper, the Great Southern Star (1890), livestock saleyards and the headquarters of the Woorayl Shire Council. Most of the buildings in Leongatha were built of timber but a bad town fire in 1913 turned people’s minds to brick construction. Local clay had been fired for some years but the bricks were of poor quality, and the fire provided incentive to improve local brick making. Examples of locally sourced brick buildings are the heritage listed showground grandstand (1922) and the memorial hall and shire office (1926). The impressive Catholic church (1913) is a further example. The butter factory supplied town electricity (1908) and its role was taken over by the State Electricity Commission in 1925. An agricultural high school opened in 1912, and its role was complemented by a State technical school in 1967. The Catholic primary school opened in 1913. Leongatha enjoyed steadily increasing populations, and had a minor building boom in the 1950s and 1960s when new churches, State primary school and a Masonic hall were built. After years of agitation a swimming pool was completed in 1960. Dairying remained the main farming activity, attracting Dutch and Italian families to the district in the 1950s and 1960s. From the 1960s, a number of mergers left the Leongatha butter factory controlled by Murray Goulburn, and the large factory at neighbouring Korumburra closed in 1975. The factory is a major employer in the town, although jobs and conditions are at risk. The provision of industrial land attracted a number of secondary industries to the town, including Cash’s woven tags (1971), engineering works, Home Pride bakery, farm machinery and concrete works. The industrial estate adjoins the Murray Goulburn factory in Yarragon Road. Leongatha is the administrative centre for the amalgamated Shire of South Gippsland, as well as service and market centre for the surrounding agricultural and pastoral district. State and Catholic primary and secondary schools cater to educational needs along with the South Coast Christian college (1978). A hospital, nursing home and medical services are located in Leongatha, as well as headquarters of the South Gippsland Ambulance Service. There are golf, swimming, bowls and cycling venues and there is an annual agricultural and pastoral show. In the town there are a cinema and the Lyric Theatre (1965). The civic area is in McCartin Street (Bass Highway) east of the railway station. It includes the court house (1912), post office (1907), memorial hall and shire office (1926), mechanics’ institute (1912) and Anglican church. The railway station is the starting point for the South Gippsland tourist railway to Nyora and the rail trail to Foster, both resulting from the line’s closure in 1993. Leongatha’s weekly newspaper is still the Great Southern Star. An annual Daffodil Festival, held since 1960, attracts visitors each spring. Moss Vale Park, about 12 km north of Leongatha, was the site of a nursery established in the late 1880s. Five hectares of the property, planted with ornamental trees, has been reserved. The park is popular for picnics, as well as outdoor music recitals.